JIEL’s latest Issue Is Out! Fresh off the press!! 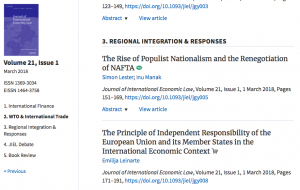 : Oxford U Press’s Journal of International Economic Law has released its latest issue on financial disputes in international courts, populism and trade, macro prudential regulation of China’s currency, and an exploration of international human rights and international economic law.